A delicious morsel of paranormal romance! Ms. Green has delivered another great read and one I anxiously awaited since finishing her debut novel, Caressed by Moonlight. Based on a world filled with curses and powerful rulers of the darkness this series has quickly climbed to the top of my favorites list. At the beginning of the book the author has provided a very helpful and well organized glossary of terms for reference though she does a great job of delicately explaining everything within the story. 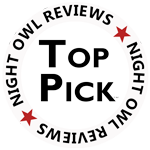 Caressed by Night is Dimitri and Kerstyn's story that takes place in Sin City. From the beginning the story's pace flowed smoothly with many turns and twists that kept me reading page after page long after I should have been completing other chores. I was fascinated by the alpha persona of the hero, Dimitri Arsov, true ruler of the Arsov vampire clan. He oozed dark power and authority yet reigned in his inner demon allowing him to be gentle and caring with the heroine. Kerstyn Ingmar surprised me on how she handled being thrown from one life style of innocence and ignorance into the dark and dangerous world of the paranormal she knew nothing about. Her ability to accept the change, the reality of vampires existing in her world and her part in this new world blew me away. I loved how she didn't judge, didn't try to make anyone see life through her views and came to mold herself into a human living in a world that normally can not survive such a dangerous realm without losing herself in the process. Sassy and curious she was able to flow from one life into the other with the help of her lover, Dimitri. And seriously, when you have a vampire as old and attractive as the ancient king, I'd want to make sure I could fit into his world too! As the two main characters come to understand their connection fate held in store for them, their story takes us on an adventure filled with high and lows. From heart warming moments of sizzling passion to heart wrenching moments of adrenaline rushes, Ms. Greene held nothing back in delivering a fast paced romance of true love and justice. We also get to meet many of Dimitri's friends. Hadrian and Gabrielle are both intriguing in their own right, followed by Falcon and Gannon. All sparked my interest each time they step on to the page making me anxious for their stories as well. There are many changes to come and adventures for the rulers of darkness I can't wait to take along side all of Ms. Greene's wonderful characters. As Caressed by Night came to a satisfying end, the promise of a wild ride in the next installment couldn't be missed! With a second release under her belt, Amanda J. Green shows true promise as a highly addictive author for the paranormal romance genre. She writes with such passion for the written word that it jumps right out at you through her great stories and characters. I've read both of her releases and I can say that this author values her readers so much so that she strives to deliver well edited and written stories. I have a feeling she will go a long way! And might I say thank goodness this series is of full length novels! Rulers of Darkness is a series I fell in love with right from the start. First with Caressed by Moonlight and now with Caressed by Night, Ms. Greene has entranced my imagination with her vampires and the world they walk in. I can't wait for book number three, Caressed by Crimson moon!